As the fighting ends in Mumbai, all that is left for the families of the casualties, the embassy's representatives and emissaries of the ZAKA rescue organization is to bow their heads with the Indian city's small Jewish community and pick up the pieces. Ahead of the bodies' final identification and their return to Israel for burial, the local Jewish community held a special ceremony Monday morning commemorating the men and women murdered by terrorists at the Chabad house. Shimon Rosenberg, the father of Chabad emissary Rivka Holtzberg who was killed in the attack along with her husband Gavriel, eulogized his daughter and son-in-law and said a prayer in their memory. He also thanked the Indian nanny, Sandra Samuel, who managed escaped from the building with his two-year-old grandson, Moshe Zvi. "With her great resourcefulness, Sandra saves my grandson's life. If she hadn't grabbed him, he would surely have been murdered," he said. Rosenberg broke into tears as he spoke, when his grandson Moshe Zvi also began crying and searching for his mother. 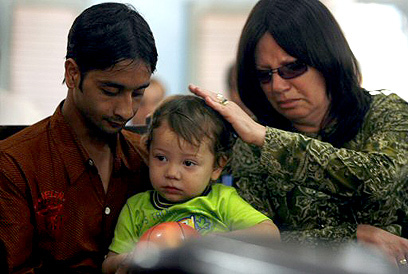 More than 100 members of the Jewish community in Mumbai attended the ceremony. Israeli Ambassador to India Mark Sofer also spoke at the event, saying that "the State of Israel will not rest as long as Israelis and Jews are massacred across the world for the sake of being Jewish. "We will continue working with the Indians and the rest of the countries in the world in order to prevent such incidents in the future. This is a difficult day for India, Israel and the Jewish people, but first and foremost for the victims' families. "Now is not the time to think about what the international community is not doing enough, or why people reach this level of brutality. Now is the time to only think about the family," he added. An Israel Air Force plane landed in Mumbai early Monday. The police's Forensic Department teams will help ZAKA members complete the identification of the bodies. Foreign Ministry representatives will then take care of the last bureaucratic arrangements with the Indians in order to release the casualties' bodies and fly them to Israel. The Israeli ambassador told Ynet on Sunday night, "We plan to wrap the bodies of the four Israeli casualties in Israel flags before putting them on the plane. Two of the casualties do not hold an Israeli citizenship, and we plan to wrap them in praying shawls." He added that "this matter is being handled by the Chief Rabbinate, and we'll act according to its orders." 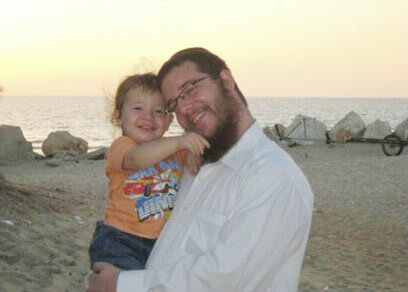 Rivka Holtzberg's parents are also expected to return to Israel on the IAF aircraft along with their grandson. The Foreign Ministry is working to arrange an entrance permit for the nanny so that she can continue caring for Moshe Zvi. The Air Force plane is expected to leave for Israel on Monday afternoon. After it lands, the funeral times will be published. Six people were murdered in the Chabad house: Emissaries Gavriel and Rivka Hotlzberg, kashrut supervisors Bentzion Chroman and Rabbi Leibish Teitlebaum, Yocheved Orpaz of Givatayim and Mexican citizen Norma Shvarzblat Rabinovich. ZAKA members are expected to return to the scene of the attack at the Chabad offices in order to collect the casualties' belongings and make sure that the place in cleaned according to Jewish Law. "They initially told us we won't be able to enter the Chabad house, but we insisted and demanded to be allowed to do our job," Zaka representative Shimi Grossman told Ynet, adding that "our representative virtually had to fight for this right." Zaka men have been taking turns guarding the bodies in the past few days in order to ensure that the Indian authorities don't perform an autopsy on them, which is forbidden by Jewish Law. See all talkbacks "Mumbai victims' son searches for mother "